Is your backyard dunny good enough for Brisbane's Poo-seum? THE famous Aussie thunderbox shares a special place in the hearts of many of those Ipswich residents who have been around long enough. Call it looking at the past through rose-tinted spectacles, but many look back fondly on the days of venturing through the back yard in the middle of the night to answer the call of nature. Although the construction of Ipswich's sewerage network began back in 1937 with the CBD, North Ipswich and Tivoli among the first suburbs to be sewered, many outhouses were still operating up into the 1970s. Many of the decommissioned thunderboxes of Ipswich are still standing, with residents converting them into storage spaces and tool sheds. Tivoli resident Lyle Barlow knows all too well the quirks and perks of the backyard dunny, having worked as a night soil man back in the 1970s. Mr Barlow's job was to clean up the waste for the township of Mount Crosby each weekend. While not the world's most glamorous job, Mr Barlow said it paid well. "Every Saturday morning, I would jump in my truck and visit around 50 homes and businesses to collect their waste and take it to the local landfill depot," he said. "I did the job for around five years and learnt pretty quickly how to avoid spills when transporting the pans." Mr Barlow's neighbour, 92-year-old Keith Currie, is the proud owner of a backyard dunny that he has converted into a handy little tool shed. Mr Currie has lived in the house since it was built in the late 1950s. The area was sewered in the 1970s. 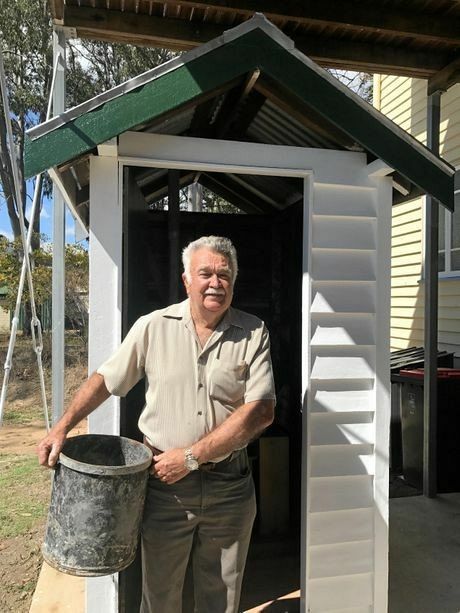 In a bid to preserve the backyard dunny, Queensland Urban Utilities has mounted a search to track down the last remaining outhouses in Ipswich before they disappear. To showcase this quirky but important reminder of how times have changed, QUU will also be setting up Australia's first ever Pooseum. QUU spokesperson Michelle Cull said Ipswich residents were invited to share their dunny history. "We want to hear from anyone who still has an original thunderbox in their backyard," she said. "We're on the hunt for old photos, memories and funny dunny stories, from braving the elements to warding off creepy crawlies. "The most interesting submissions will feature in our Pooseum; a one-of-a-kind mini-museum which we're setting up at our Innovation Centre at Luggage Point Sewage Treatment Plant in Brisbane." Stories like Mr Barlow's will be preserved in our Pooseum, which will be an important reminder of how far south east Queensland's sewerage network has come since the early 1900s. "We have around 9000km of sewer pipes in our network and 29 sewage treatment plants which treat around 44,000 Olympic swimming pools of waste every year."